Legislation being considered by the public health committee would require medical mishaps reported by state hospitals to finally be made public. Legislation introduced in 2002 required hospitals in Connecticut to report adverse events. In 2004, the legislature rewrote the law, narrowing the list of events that must be reported and included provisions to keep reports secret unless they were investigated. The proposed bill, drafted by the attorney general’s office, would eliminate a confidentiality provision added in 2004 to the state’s “adverse event” law. 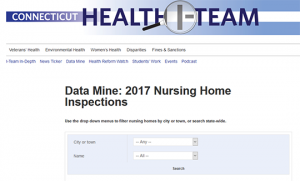 The draft also calls on the state Department of Public Health to conduct random audits of hospitals to determine compliance with the reporting law, with each violation bringing a fine as high as $10,000.